Bullet Stop, Inc. is Northwest Ohio's only exotic handgun dealer. The gun shop stocks Wildeys, Freedom Arms, L.A.R., ect. A full line of handguns, rifles, and shotguns are available as well as ammunition, knives, and reloading supplies & accessories. 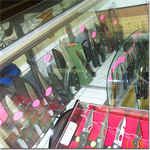 Bullet Stop will gladly special order any item not currently in stock. Guns are also available for rent if a customer wishes to try one out before purchasing a certain caliber. Bullet Stop, Inc. offers Class 3 weapons (machine guns) for sale and rent!